If you have gone to a church wedding, gotten married or even watched a wedding chances are you heard this chapter from Paul’s letter to the Corinthians. It is one of the most popular of Paul’s writings and perhaps of all the books in the bible. Paul has been speaking to the people about the church and each person having a gift in the church. 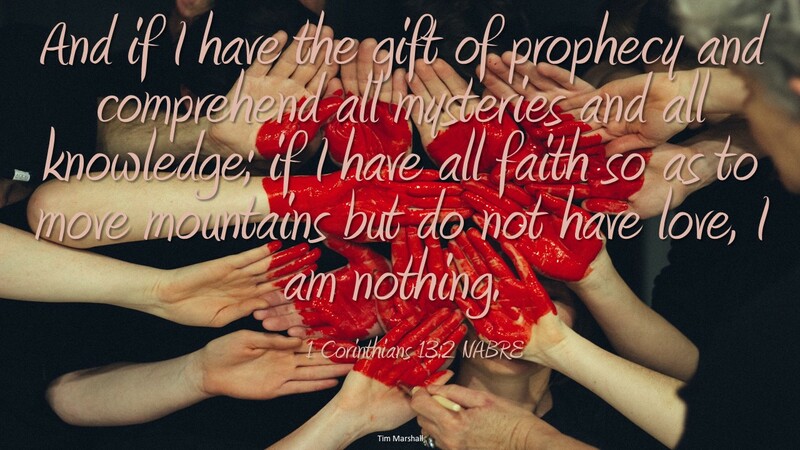 Just before the chapter with the quoted verse Paul speaks about the gifts of people in the church, some are apostles, prophets, teachers, doers of mighty deeds, healers and more. Then Paul says the gift doesn’t matter if you do not love. The entirety of chapter thirteen speaks about love, ending with the most famous line; “faith, hope, love remain, these three; but the greatest of these is love.” (1 Corinthians 13:13) So you can be God’s servant and deliver a prophetic message, you can comprehend and know everything, you can have such strong faith to move a mountain, but without love, you are nothing. He does not say your gifts are diminished, he says you are nothing. Nothing! We are made for relationship, we are created to love, to love God and to love one another. If we don’t we are nothing, we do not exist without love. We chase success, knowledge, understanding, achievement but are we satisfied? We learn from Paul without love, without someone sharing our achievement we are nothing. It is unusual to be without love, but to be so alone and unconnected could be like a death. It is not a death that ends life once but a daily dying. Loneliness is an epidemic today, we are more connected and more alone all at the same time. To be something we must love and be loved.